There are countless joys in planning (and attending!) a wedding, like the meaningful participation in age-old customs and traditions. The institution of marriage alone has been around for as long as history can recall, so it’s no wonder that a wedding involves a handful of classic rituals. 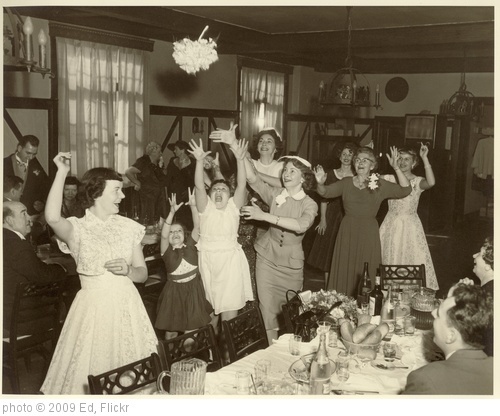 One such practice that has always intrigued me is the throwing of the bouquet. You know the scene: the bride is at her reception, facing her back to all of her single female guests who eagerly wait for her to toss the bouquet in the air. The flowers fly in slow motion as the women reach their hands out, shoving one another and keeping their eyes on the prize. Finally, one of them catches the bouquet, shrieks in excitement and accepts a bunch of forced congratulations from the envious ladies who drag themselves back to their tables in defeat. The custom suggests that the woman who catches the flowers will be next to wed, which might explain the eager batch of bouquet-hungry women who participate in the practice. But, the meaning of the climactic catch originates from the historic belief that the bride is saturated with good luck and fortune on her wedding day. In 14th century Europe, guests were so enthralled with getting their share of this ethereal luck that it was customary to actually rip and tear at the bride’s dress, in hopes of taking home a physical piece of her, and sub sequentially some of her good fortune. However, the idea of people pulling and grabbing at a beautiful wedding dress is anything but ethereal. In today’s world, that just won’t do. While the modern day, fabulous bride may be all about sharing her luck with family and friends, there’s just no way that they’re getting near her Vera Wang with lace appliqué. Forget it. So naturally, we’ve adapted. Cue the tossing of the bouquet. It’s a less messy way for the bride to share her luck with the guests. Plus, the dress stays safe. Some couples include a garter toss, incorporating an actual piece of the bride’s clothing and staying in stride with the 14th century tradition. It’s customary for the groom to remove his bride’s garter and toss it to the single bachelors in attendance. The man who catches it is supposed to pair up with the woman who catches the bouquet, placing the garter on her leg to symbolize their newfound luck. That luck doesn’t necessarily mean another I do, but who knows, right? Maybe the garter catcher and the bouquet catcher hit it off and have a spring wedding in the works. Maybe not. Regardless, it’s all about sharing the luck. A lot of couples completely toss out the idea of having a bouquet or garter toss at all. 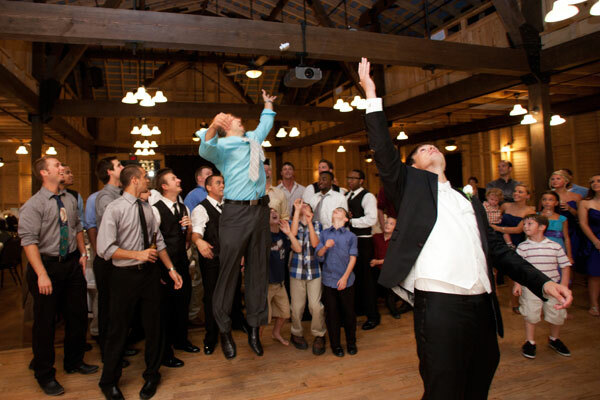 Some people worry that the bouquet toss uncomfortably isolates single people at the wedding. It’s a time to celebrate the beauty of true love and finding your soul mate, not a time to remind people of their loneliness. So, a common alternative to the bouquet toss is having a special song played by the band or DJ to honor those couples at the wedding that are already married. The song starts and all married couples are called to the dance floor. Slowly, couples leave the floor according to the number of years they’ve been married, in ascending order. The goal is that by the end of the song, the couple left dancing is to be revered as King and Queen marriage. They represent veterans of the married world, to be seen as an inspiration; the paradigm of what newly married couples hope to become: a loving partnership to last a lifetime. There are so many special traditions to consider when it comes to the wedding. Age-old or brand new, they each have a special meaning to celebrate. Of course, every couple is unique and every wedding differs. In fact, perhaps the only true tradition consistently upheld in modern weddings is that no two ceremonies or receptions are exactly alike. The great freedom of the contemporary bride and groom allows them to celebrate in their own unique fashion, bouquet-toss or not.